You're probably thinking: "What, the boxes?" Well, of course the boxes! Why? 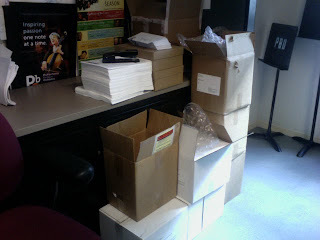 Because they contain all of the materials for our 30th Anniversary Season subscription renewal mailing. Keep an eye out, we're just six days away from announcing next season's programming! Would you like a hint about what the orchestra and chorale might be performing? Here it is: Our musicians will perform, for only the second time in 30 years, the very first work that they played at their very first public concert. Can you guess what it is? Freebird? In A Gadda Da Vida? Funkytown?? ?